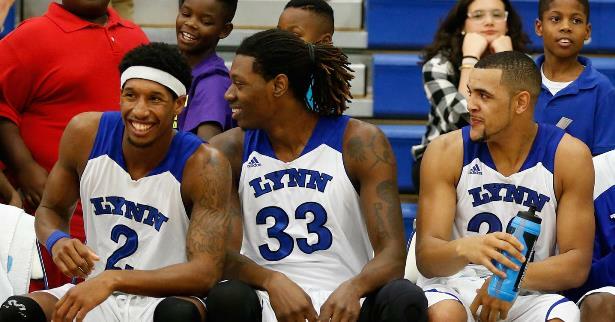 BOCA RATON, Fla.- It’s only fitting that the Lynn University men’s basketball team is back in the Division II Media Poll this week after a pair of big Sunshine State Conference wins. Lynn, who is 20th in the nation and third in the South Region, is one of three SSC schools in the top-25. The Fighting Knights (10-2) are 4-0 in the SSC for the first time since the 2005-06 season. Lynn was ranked 20th in the December 16th poll but dropped out after back-to-back losses against Midwestern State and Winston-Salem State. Since those losses, the Fighting Knights have won four-straight, most recently defeating Eckerd 71-67 in overtime. The Blue & White has no easy task at hand this week with a pair of road games at Palm Beach Atlantic (5-7) on Wednesday, January 14, and Saint Leo (10-5, 2-2 SSC) on Sunday, January 18. Sunday’s SSC game against the Lions will be broadcasted live on national television via CBS Sports Network as the Division II Game of the Week. Fans in the South Florida area can view the game on AT&T U-Verse and Century Link on Channel 643, (1643 in high-definition), Comcast Channel 744, Direct TV Channel 221 and Dish Network Channel 158. Tip-off is slated for 7:30 pm at Palm Beach Atlantic on Wednesday, January 14. Fans can follow the action live at LynnFightingKnights.com. Don’t forget to ‘Like’ us on Facebook and follow @Lynn_Knights on Twitter and Instagram.